1Lt Louis M. Benepe (P)(POW) - CoPilot missions: Dispatched on 5 missions with 1Lt Arni L. Sumarlidason (P) - (51 (A), 52, 53, 59, 60; One mission with 1Lt William S. Monahan (P) - (65). First Pilot mission (61). POW on 31 Aug 1943 (mission 65). Completed six credited combat missions. 2Lt Aubrey L. Emerson (CP)(POW) - Flew no missions with 1Lt Benepe Crew. CoPilot missions: Dispatched on six missions with 1Lt Frank H. Thompson (P) (54 (A), 55, 56 (A), 57, 60, 61); Dispatched on nine missions with 1Lt Donald F. DeCamp (P) - (72 (A), 73, 74, 75, 76, 77, 80, 81, 82). Upgraded from CoPilot to Pilot on orders dated 9 Dec 1943 and dispatched on 10 missions as First Pilot (83, 84, 85, 86 (A), 87, 88 (Spare Returned), 89, 91, 93, 98). Became a POW on 11 January 1944, mission 98 to Oschersleben, Ger. in B-17F 42-24562 Sky Wolf (358BS) VK-A [MACR #1925] .B-17 was in distress at 20,000 ft before reaching the target and peeled off from the formation and crashed at Wolsdorf, Ger. (1 KIA and 9 POW). Completed 20 credited combat missions. 2Lt Raymond J. Cassidy (N) - Flew on three Dispatched (2 credited) missions with 1Lt Sumarlidason (P) and 1Lt Benepe (CP) - (51 (A), 52, 53). 2Lt Richard A. Sager (B)(WIA) - Flew on five dispatched (4 credited) missions with 1Lt Sumarlidason (P) and 1Lt Benepe (CP) - (51 (A), 52, 53, 59, 60), One missions with 1Lt Benepe (P) (61) and two missions with other Pilots (50, 57). Completed 7 credited combat missions. Was badly wounded on his last mission (61) was hospitalized and later returned to the USA. T/Sgt Stanley J. Backiel (E)(POW) - Flew on five dispatched (4 credited) missions with 1Lt Sumarlidason (P) and 1Lt Benepe (CP) - (51 (A), 52, 53, 59, 60), one mission with 1Lt Benepe (P) - (61) and 17 dispatched (14 credited) missions with other Pilots: 2Lt Sumarlidason (57, 69, 73, 74); 1Lt Paul W. Campbell (75, 76, 78 (A), 79, 80, 83 (A), 86, 91, 95, 96(A), 97, 98), Major Mitchell (84). Completed 19 credited combat missions. Became a POW on 11 January 1944, (Mission 98) to Oschersleben, Ger. in B-17F 42-30865 (No name) (358BS) VK-G [MACR 1927], 1Lt Paul W. Campbell (P). B-17 crashed near Nordhausen, Ger (6 KIA and 4 POW). T/Sgt Richard C. Grimm (R) - Flew on five dispatched (4 credited) missions with 1Lt Sumarlidason (P) and 1Lt Benepe (CP) - (51 (A), 52, 53, 59, 60), one mission with 1Lt Benepe (P) (61) and one mission with 1Lt Sumarlidason (P) - (57). Completed 6 credited missions with the 303rd BG(H). On 25 July 1943 (Mission 53) to Hamburg, Germany T/Sgt Grimm replaced T/Sgt Bruce R. Clemens in the Ball Turret after T/Sgt Clemens became sick and climbed up from his Ball Turret to the Waist using his A-13 oxygen bottle. The oxygen bottle became empty before T/Sgt Grimm could hook up to the Ball Turret Oxygen system and hook up his electric flying suit. T/Sgt Grimm passed out from lack of oxygen. After being unconscious for about 30 minutes T/Sgt Grimm was rescued from the Ball Turret and was treated until he revived. He was transported to the 303rd Hospital after landing at Molesworth and recovered shortly thereafter. T/Sgt Grimm Transferred to the 367th BS/306th BG(H) at Thurleigh, England following mission 61 and flew on 29 missions with this Group (19 Feb to 11 April 1945). Completed 35 missions with the 8th Air Force and following WWII flew 25 missions with the Air Sea Rescue Service in Korea. T/Sgt Francis H. Stender (BTG/WG/TG) - Flew on five dispatched (4 credited) missions with 1Lt Sumarlidason (P) and 1Lt Benepe (CP): As BTG (51 (A), 52, 53); As RWG (59, 60) and one credited mission with 1Lt Benepe (P) - (61). Also flew on 26 dispatched (25 credited) missions with other Pilots: As Waist Gunner (57, 85(A), 87, 88, 131); As a Lead Crew Tail Gunner (106, 111, 113, 119, 123, 127, 131, 134, 137, 141, 145, 147, 152, 154, 155, 156, 158, 160, 163, 165, 178, 180, 183). Completed a 30 mission combat tour on 18 June 1944 (Mission 183). Was the only member of the 1Lt Benepe crew to complete a combat tour. T/Sgt Bruce R. Clemens (RWG) - Flew on 3 dispatched (2 Credited missions with 1Lt Sumarlidason (P) and 1Lt Benepe (CP) - (51 (A), 52, 53). S/Sgt Edward J. Cassidy (LWG/TG)(KIA) - Flew on five dispatched (4 credited) missions with 1Lt Sumarlidason (P) and 1Lt Benepe (CP) - (LWG - 51 (A), 52, 53, 59, 60) and one credited mission with 1Lt Benepe (P) - (LWG -61). Also flew on 16 Dispatched (13 credited) missions with other Pilots: 1Lt Sumarlidason (LWG - 57, TG - 73, 74), 1Lt Paul W. Campbell (TG - 75, 76, 77, 78(A), 79, 80, 83(A), 86, 95, 96(A), 98); Other Pilots (TG- 91 and LWG -97). Completed 18 credited combat missions. Was Killed in Action on 11 January 1944 (Mission) 98 to Oschersleben, Germany in B-17F 42-30865 (No name) (358BS) VK-G, 1Lt Paul W. Campbell, Pilot (MACR 1927) (6 KIA and 4 POW). B-17 crashed near Nordhausen, Ger. S/Sgt Cassidy is buried in the Ardennes American Cemetery at Liege, Belgium. T/Sgt George W. Buske (TG)(WIA) - Flew on five dispatched (4 credited) missions with 1Lt Sumarlidason (P) and 1Lt Benepe (CP) - (51 (A), 52, 53, 59, 60) one credited mission with 1Lt Benepe (P) - (61) plus 7 dispatched (6 credited) missions with other Pilots - (57, 81, 83, 84(A), 85, 86, 90). Completed 11 credited combat missions. Was wounded on 20 December 1943 (Mission 90) to Bremen, Germany flying in B-17F 42-29664 Jersey Bounce, Jr. (358BS) VK-C. The B-17 had been attacked by German Fighters with attacks concentrated on the tail. T/Sgt Buske was badly wounded and as the attack continued staggered back to his tail gun and was again wounded in the chest and face by a 20mm shell. Pieces of metal lodged in both eyes, impairing his vision so that he could only distinguish blurred shapes. He declined first-aid treatment and continued firing his guns. Pilot 2Lt Henderson and CoPilot Capt Hungerford were forced to Ditch their B-17 just off the English coast and the crew was soon rescued by a passing vessel. While abandoning the ditched B-17 T/Sgt Forrest L. Vosler, himself wounded, crawled out onto the wing unaided and held T/Sgt Buske as their slipped into the water until other crewmen would rescue them both and assisted them into the dinghies. For his exploits T/Sgt Vosler was awarded the Medal of Honor Medal and T/Sgt Buske was awarded the Silver Star Medal. See Saving Sgt. Buske. 2Lt Arni L. Sumarlidason (Instructor Pilot) with the 1Lt Benepe Crew. Completed his 25 mission combat tour on 4 Oct 1943. 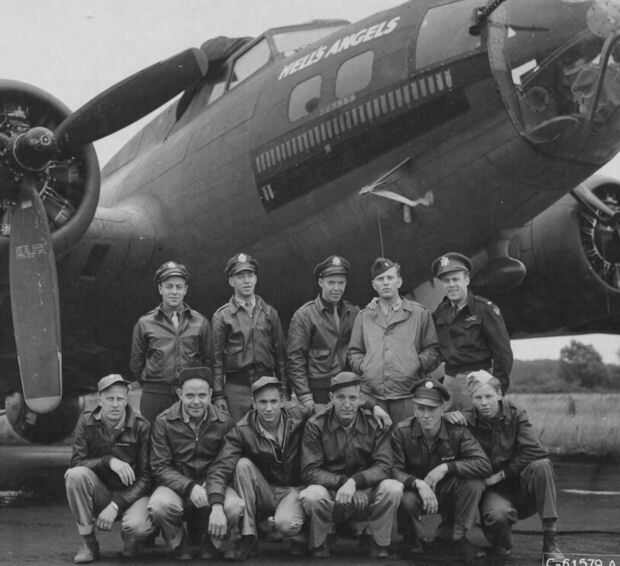 Mission #53, 25 July 1943 to Hamburg, Germany in B-17F 42-5264 Yankee Doodle Dandy (358BS) VK-F - flown by crewmen in photo. The mission Bomb Groups were attached by 150-200 German fighters for over 45 missions. Was the last mission for wounded crewmen 2Lt Raymond J, Cassidy (N) and S/Sgt Bruce C. Clemens (BTG). 2Lt Aubrey L. Emerson (CP) was wounded when his foot caught in the upper turret mechanism. S/Sgt Richard C. Grimm (R) passed out from lack of oxygen after he had replaced T/Sgt Bruce R. Clemens in the Ball Turret. The B-17 made two landing attempts at Molesworth. On the first attempt the B-17 was caught in the prop wash from another B-17 and nearly dived into the ground. Visiting Eddie Rickenbacker, WWI Fighter Ace, and Col Kermit Stevens, Group CO, who were standing near the end of the runway, had to dive into the mud on the runway side to avoid being hit by a wing. Quick retraction of the landing gear by T/Sgt Stanley J. Backiel (E) gave the B-17 extra lift that avoided a crash landing. One of the engines of Yankee Doodle Dandy ran out of fuel. 1Lt Sumarlidason (P) and 1Lt Benepe (CP) then made a smooth three engine landing after circling the Molesworth airfield.